10. So, where did you learn to have this kind of relationship with your daughter? I cannot really say I was taught. It came with excitement and passion and I tried, because I always give my best to every aspect of my life. Growing up, we didn’t stay with my dad so we didn’t have time with him. He only provided through my mother. I grew up with my sisters not with my brothers, so no one really taught me how to be a dad. I don’t think it’s something you can learn but it’s something that you can create for yourself. And that’s the problem with young dads is that we think that having a child is more about providing financially. Of course, they need this provision but it’s not the only thing. If someone is unemployed they tend to run away because they cannot provide financially for their child, but there are other ways to give – emotionally and physically just by being there. Acknowledging the gift that you’ve been entrusted with. It’s a very special gift to have someone to carry your bloodline and to have your own creation. 11. You said that this is not something one can learn – could you clarify that? It’s not about learning it. It’s there in us naturally. It’s all about unearthing it. You cannot learn to love because love comes naturally to a human heart. It’s just that people don’t take care of it and it can fall away and be buried under emotion and fear. Fear of not being good enough, fear of failing to provide, fear of taking responsibility. The capacity to be a good dad is there, it just needs to be nourished and watered like a plant. I’ve seen it with many guys who are fathers. They hardly see their children but when you sit and talk they say with pride, “Ah, this is my son, this is my daughter.” Which means that it’s there, but they haven’t found ways to nourish it or they don’t have that support structure to help them realise their potential as fathers. 12. What relationships in your life have supported you as a dad? My partner’s mom and her dad before he died in 2016. They were very supportive because my partner and I were in our final year at University when she fell pregnant. My partner’s mom looked after the baby during the day so that made our lives so much easier. My partner also has encouraged and supported me in my relationship with our child. Emotionally and physically, my sisters have been there supporting us. But the person that stands out the most in my partner’s mom. She did so much for our daughter. 13. What has been your biggest dad mistake? I am not perfect. There are times when I get into a fight with my partner and I am so emotional that I shut down and then maybe I won’t call her. But by not calling her I won’t speak to my daughter. If I don’t see my partner, I don’t see my daughter. Not that she’s punishing me, but it’s a choice that I make because I am angry. In the beginning I would only spend time with her when her mother was present but my partner said to me that I need to spend time with my daughter without her being present. Now we hang out more alone together and then we have time together as a family. What happens is if you break up with your partner and the relationship with your child is relying on your relationship with her, then you run the risk of your relationship with your child to be broken. 14. As a father, what does it mean to you to protect your daughter? My partner and I allow her space to be open and talk about anything. Knowledge is power, so we teach her about her body and private parts and who can touch her where. We have a rule that only her mom can touch her private parts when necessary. We have taught her that if anyone comes to the gate, even if it is me, she always has to run inside to tell her mom or granny first so that they are aware there is a visitor. 15. What do you enjoy most about your daughter? What I enjoy most is seeing myself in her. Seeing how she has copied me almost completely, even the way she sits. I really enjoy that she is confident, active and fearless. She’s a fast learner…she’s amazing! 16. What has she taught you? A lot! 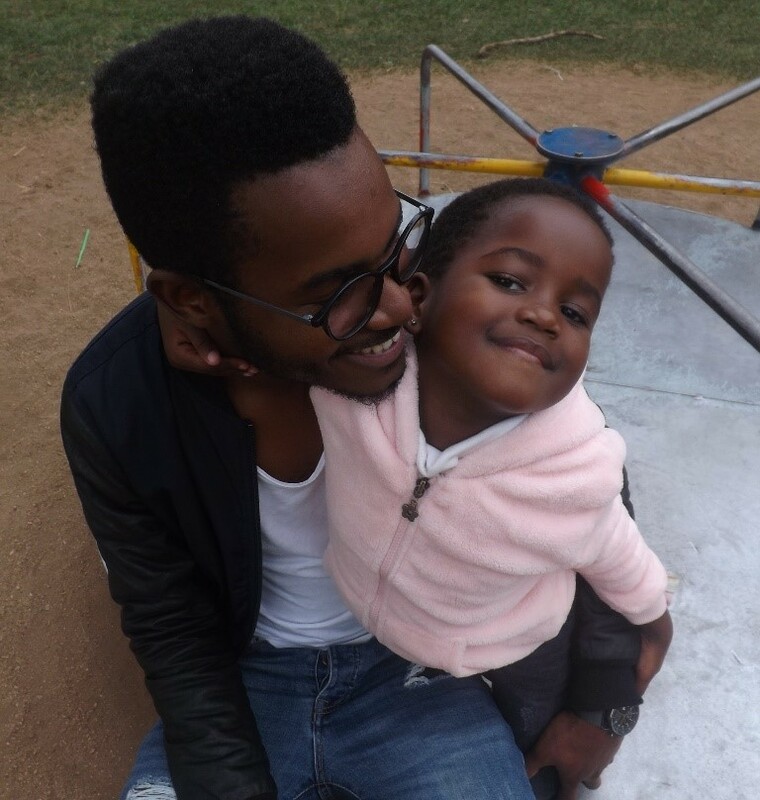 She’s taught me that love between a child and their parents is one of the most fundamental things that there is in life. And I get her love in return. You learn to appreciate life more. Recently, she’s been able to differentiate when my partner and I talking and when we are disagreeing about something. I’ve learnt to be careful around her because sometimes you overlook that as parents. We get lost in our own emotions and forget that someone is watching. She has taught me to be patient because when I’m trying to teach her something, it just doesn’t happen overnight. But eventually she gets it. And when she does, that’s the most amazing feeling. You need to step down to their level and be playful! 17. What message would you have to other fathers, especially younger fathers? I would say, at first it is scary, I won’t lie. You will ask yourself, will I be able to do this? It can be challenging. Sometimes you can feel like you’re not sure and I think that’s only natural. I would say to them, if you are willing commit yourself to love first. Don’t think about the other stuff, think about love and what love means to you. Because if we put ourselves in a situation of love you will begin to think differently. And once you look in their eyes and see the look of trust and innocence, once you hold them and start to bond you will see that you have been entrusted with something special. I really believe we all have it in us and it’s not impossible to love. You can get married and get divorced. You can have friends and then the friendship might end, but parenthood is for life. Every day counts. What we do today will determine our relationship with our child tomorrow.